Hello friends, you may be thinking to buy a sewing machine to sew the leather purse, jacket and handbags with ease. In this post, I am going to provide you a deep knowledge on leather sewing machines. You can get an idea. It will be helpful to you to choose the best Sewing machines for sewing leather purse and bags. If you are new to sewing leather and got confused after reading so many stuff on the internet then this is the right place. If you are a beginner and not going to sew much thick leather then check beginner sewing machines for sewing leather. If you are looking to start your own small leather handbag making or purse making shop then read the post. You will definitely find the best Sewing Machine For leather to start your business. An advanced sewing machine can also sew leather, but for making leather purse and jacket experts recommend a cylinder arm, compound feed and walking foot sewing machine. A flat bed machine can sew the seams inside out and do a fine job. But once the bag/purse takes on a shape, its became difficult to sew it on a flat table. Best Sewing Machines Under $100. Sew through Leather, up to 3/4 Thick. This machine will also sew nylon, canvas, urethane, plastic, sheepskin, etc. No need to worry about cords, outlets or mechanical hook-ups because this machine is designed to be completely self-sufficient. A Simple pull of the handle is all it takes to start stitching. The Tippmann Boss Leather Sewing Machine completes a precise lock stitch with every pull of the handle. The Tippmann Boss is fully adjustable on stitch lengths, thread sizes, needles, tension, etc. You can count on the Boss to deliver accuracy and consistency on every stitch. Designed and built with a rugged cast-aluminum housing, the Tippmann Boss Heavy Duty Sewing Machine will give you many years of service. Whether it’s crafting or repairing, you will be satisfied with the professional results. The Tippmann Boss comes with a one year warranty on all parts and labor and a 30 day money-back guarantee. This machine is hand powered. The lever on the right side of the machine operates just Like a slot machine handle. A pull of the handle all of the way down and all of the way up is one full lock stitch. This machine is completely self-sufficient. The Boss can be clamped to any table, tailgate, or trade show table and put to work immediately. There is no need to for any electrical hook-ups, because this machine is completely hand driven. The Boss is ready to sew out of the box, however there is a learning curve to properly adjusting the machine to your project. Learning how to adjust tension, stitch length and foot pressure will help to produce high-quality workmanship . It also includes an owners manual and instructional DVD. We also offer a Toll-Free tech line to help to learn the ins and outs of the Tippmann Boss. The simple design of the Boss allows even the beginner to learnto sew with a machine. The Techsew 2600 PRO is designed for sewing products such as chaps, jackets, vests, handbags, belts, upholstery, saddlebags, boots as well as automobile and boat covers, sails, tents, awnings, luggage, orthopedic appliances, sports equipment and more. The 2600 PRO features a narrow cylinder arm which is ideal for sewing into tight areas and insides of leather bags. The 2600 PRO features the latest in sewing technology, including the SmartServo-NP motor, TLG Laser Guide and more. The Techsew SmartServo-NP is an automatic needle positioning motor which saves you tons of time and effort while sewing. This powerful and versatile motor will automatically lift the needle at the end of a seam, or automatically leave it in the bottom position. This will eliminate the need to constantly turn your handwheel to position your needle. The Techsew TLG Laser Guide provides a perfectly straight laser guided line directly in front of your needle. No more grooving your leather before sewing – now you’ll get a perfectly straight seam every time by sewing right along the laser guided line. Our exclusive swing down roller guide will help guide the edge of your leather to deliver perfectly straight stitches. The swing down roller guide swings up and out of the way for when you want to turn your work or sew without it. Are you sewing long or flat items? The flatbed table attachment fits directly over the cylinder arm of the machine, instantly converting it to a flatbed machine. Now your large projects won’t fall or hang over the edge of the cylinder arm. The flatbed table attachment fits directly over the cylinder arm of the machine, instantly converting it to a flatbed machine. Now your large projects won’t fall or hang over the edge of the cylinder arm. Left toe zipper foot – for sewing close to the edge or around hardware. 1 lb. spool of Techsew premium bonded nylon thread. 3 pkgs. of Organ needles. Narrow cylinder arm diameter of 1 7/8″”. Compound walking-foot (alternating presser feet + needle feed + feed dog) to help feed thick & bulky materials. Includes the Techsew SmartServo Motor for complete control at any stitching speed – great for novice, amateur or experienced sewers. Reverse Feed to reinforce stitching. Uses needle type 135X17, sizes #18 to #23. Allows for use of thread up to size #138. Includes complete table, motor, lamp, bobbin winder, needles, bobbins, tools, oiler, instruction manual. Includes Limited Lifetime Warranty and FREE technical support for the life of your machine. This Machine comes inspected, oiled, adjusted and READY TO SEW. Presser foot clearance: 5/8″ (16mm). Cylinder Bed Diameter: 1 7/8″. Needle Sizes: #18 to #23. Thread sizes: #45 to #138. The Techsew 2600 is designed for sewing products such as chaps, jackets, vests, handbags, belts, upholstery, saddlebags, boots as well as automobile and boat covers, sails, tents, awnings, luggage, orthopedic appliances, sports equipment and more. The Techsew 2600 features a narrow cylinder arm which is ideal for sewing into tight areas and insides of leather bags. It has many features the diameter of narrow cylinder arm is 1 7/8″. It has compound walking foot which helps in sewing thick and bulky materials. It ha large capacity bobbins which is essential for industrial sewing machines. You can also control the sewing speed at any point and at any stitching speed using the smart servo motor which the machine provides. It is very good for novice, amateur and professional sewers. It has reverse feed mechanism to speed up the stitching. SmartServo Motor: 800W, 1HP, 110V. The Techsew 2750 is designed for sewing chaps, jackets, vests, handbags, belts, upholstery, saddlebags, boots as well as automobile and boat covers, sails, tents, awnings, luggage, orthopedic appliances, sports equipment and much more. Sews up to 3/8″ thick leather. Drop-in bobbin case provides easy and convenient access to the bobbin. Safety Clutch prevents damage to the rotary hook. Uses needle type 135X17, sizes #18 to #24. Allows for use of thread up to size #210. Includes complete table, motor, lamp, bobbin winder, needles, bobbins, tools, oiler, instruction manual Includes Limited Lifetime Warranty and FREE technical support for the life of your machine. Machine comes inspected, oiled, adjusted and READY TO SEW. Needle Sizes: #18 to #24. Thread sizes: #45 to #210. The Techsew 2800-B is designed for sewing purses, handbags, suitcases, bags, wallets, notebook covers, jackets, canvas bags and more. It features a binding attachment which guides and folds binding tape over the edge of your material as you sew. Compound walking foot feeding mechanism. Sews up to 3/8″ material thickness. Table & adjustable speed SmartServo motor include. Compound walking-foot (alternating presser feet + needle feed + feed dog) to help feed thick & bulky materialsIncludes the Techsew SmartServo Motor for complete control at any stitching speed – great for novice, amateur or experienced sewers. Includes 19mm (3/4 inch) Binding Attachment and Binding Rack. Maximum stitch length: 5 Stitches Per Inch (5mm). Thread sizes: #46 to #138. The Techsew 2900L is the finest in leather patching machines, designed for repairing shoes, boots and purses and sewing patches onto leather. It has Compound walking-foot feeding mechanism. It can sew up to 3/8″ material thickness. It has SmartServo-NP needle position motor. It also has TLG laser guide. It can Swing down roller guide. It Includes table and adjustable speed SmartServo needle position motor. It has 18″ Long cylinder arm. It has a Large bobbin. It has 360-degree rotating presser foot for sewing in any direction. It has 1/4″ sewing capacity. It has Reinforced steel pedestal stand on wheels for a largest work area. It is Powered by the Techsew SmartServo motor & speed reducer for slow and controlled stitching speedsCan be manually operated by hand. Includes needles, bobbins, tools, instruction manual. Maximum sewing speed: 500 SPM. Needle sizes: #16 to #20. Thread sizes: #46 to #90. Techsew SmartServo motor: 800W, 1HP, 110V, 18 speed settings from 100 to 1800RPM. It is small cylinder bed lockstitch, walking foot sewing machine. Large 1.4 capacity Hirose® hook. SewQuiet DC servomotor, and UberLight LED light. Tool kit, drawer and thread stand included. It is a single needle, high speed, narrow cylinder arm, lockstitch machine. It has unison-feed (needle-feed, drop-feed with alternating presser feet. It has a large horizontal rotary hook, reverse feed and synchronized binder. It uses Singer 111W style walking feet. The Unison feed prevents slippage between layers. It is convenient for medium and heavy weight materials. It is more ideal for leather, vinyl and various synthetic fabrics. It has a horizontal binder for sewing arched and curved products such as cushions, boots and bags etc. This is the end of the post. I have tried my best to provide the best information in this post. Dear Sir, kindly advice what will be the best sewing machine for sewing designers bags, shoes, and jackets. Is it the Tipmann? Please I need the techsew sewing machine for leathers , shoes and belts. And that is available to ship to Nigeria. The price / and best of them. And the affordable one. 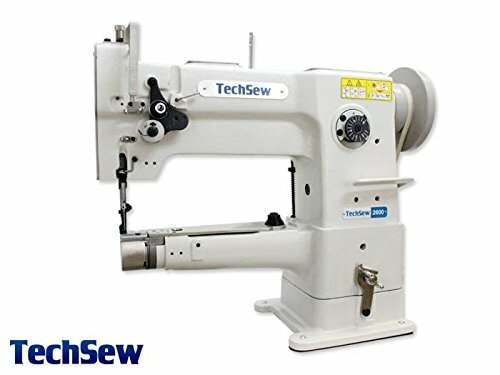 Please I need the techsew sewing machine for leathers bags , shoes and belts. And that is available to ship to Nigeria. The price / and best of them. Kindly email me your equipment list that are available in Mumbai. please how much is the machine for sewing leather bags and purses…. I am looking for high quality luxury leather hand bag/purse manufacturers in India or who can supply in India.